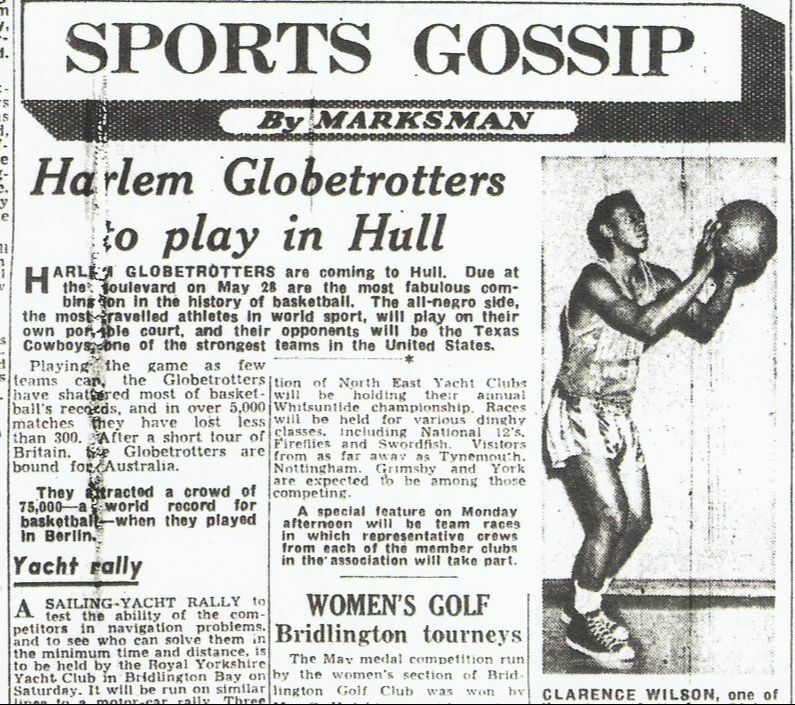 Hull has witnessed many visits over the years from international sporting teams but few could match the quality of the Harlem Globetrotters basketball team that thrilled a crowd of over 10,000 at the Boulevard in 1956. The Harlem Globetrotters remain active today and made a return visit to the city in the late 1980s to play again at the gymnasium adjacent to Boothferry Park, the former home of Hull City, but the interest couldn’t compare to the excitement that was generated when they first appeared in 1956. The Globetrotters originated in the 1920s in the south side of Chicago, Illinois. A talented group of African American basketball players they initially started playing exhibition games under the title the ‘Savoy Big Five’ before dances that were held at the Savoy Ballroom in Chicago. 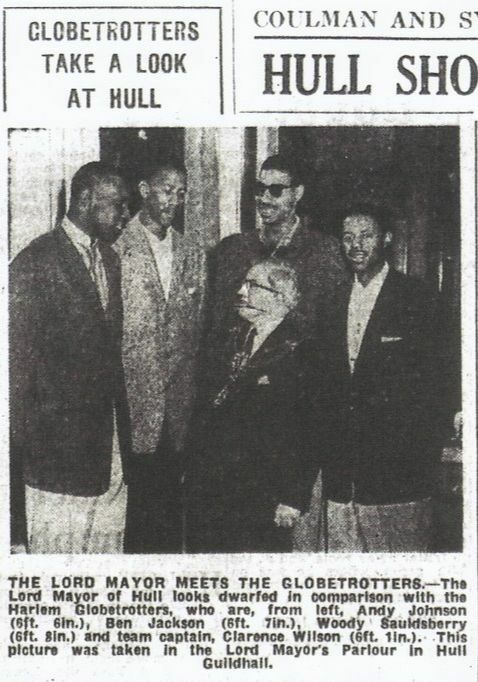 After a fall out with management the team re-formed in 1929 as the New York Harlem Globe Trotters under the management of Abe Saperstein who selected Harlem within the title as it was regarded as the centre of African-American culture at that time. The show was brought about because at the time it proved difficult for the team to arrange matches against other non-African American basketball teams. The Globetrotters were regular participants in the World Professional Basketball Tournament and eventually become World Champions in 1940. The Globetrotters gradually worked comic routines into their act and became well known for entertainment rather than sport. The Globetrotters were eventually eclipsed by the rise of the National Basketball Association (NBA). This was particularly the case when NBA teams began fielding African-American players in the 1950s. The Globetrotters regularly toured internationally and it was on one of these world tours in May 1956 that the team visited Hull. They played an exhibition game at the Boulevard, the home of Hull Rugby League club against the Texas Cowboys. The game generated significant interest in the city with the team known as much for their entertainment value as for their sporting prowess. Below is a promotional video made by Castle Films in 1956 showing the Globetrotters in training and on the court. The team of 1956 included a young ‘Meadowlark Lemon' who would go on to become synonymous with the Globetrotters in a career that spanned 22 years and over 16,000 games. 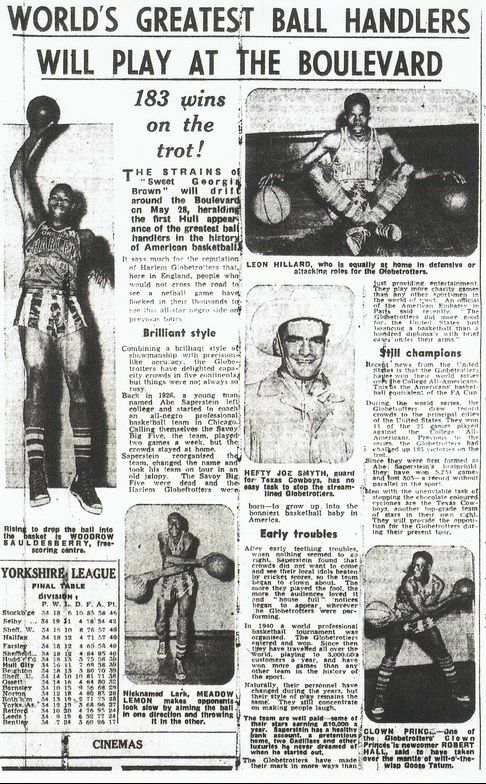 The game itself finished 58-48 in favour of the Harlem Globetrotters and as the Daily Mail report published on 29 May 1956 showed the crowd loved the entertainment provided. In addition to providing the public with great entertainment members of the team also found time to visit parts of the city and were captured making a special visit to Wilberforce House (see photo below).